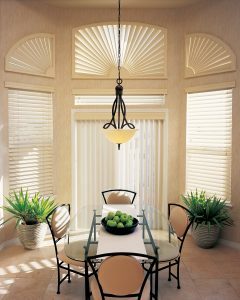 Decorate Windows in Your Home and Business with Hardwood and Fauxwood Shutters, Horizontal Blinds, Cellular Shades. Shore Blinds and Shutters offers a wide selection of window covering options and name brand products to fit almost every type of decorating requirement. If you are looking for window coverings for windows in your home or business, ask the experts for help in selecting a window treatment that’s best for you. We provide top quality window coverings to the entire Grand Strand-including North Myrtle Beach, Myrtle Beach, Conway, and as far south as Pawley’s Island and Georgetown, SC . “We offer a complete line-up of window coverings for just about every type and style of window.” Says Simon Brand.